Across Glove Story‘s beautiful endpapers you’ll find 80 of the world’s greatest ever keepers, all captured in unmistakable style by the book’s illustrator, Doug Nash. Fourteen eightieths of Glove Story’s wonderful endpapers. Doug is selling posters of his goalie-friendly creations – complete with correct kit, gloves and boots – at his own website, TheArtOfGoalkeeping.com. He offers posters and T-shirts featuring the goalies from the book as well as other shot-stopping stars from many individual clubs. 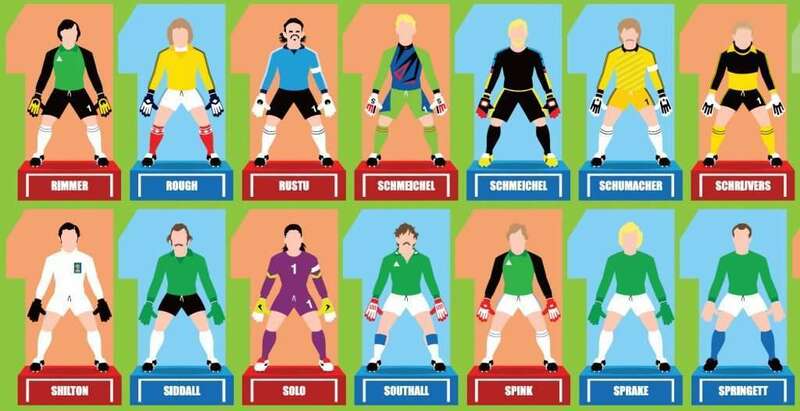 To celebrate the launch of Glove Story, Doug has created for Conker Editions an exclusive Home International Greats A2 poster, which features his selection of the finest British goalies ever to pull on the hallowed yellow nylon of England, Scotland, Wales and Northern Ireland. 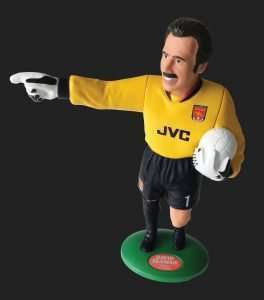 From Banks and Shilton to James and Hart; Pat Jennings and Harry Gregg; Alan Rough, Jim Leighton, Andy Goram; from Leigh Richmond Roose via Gary Sprake to Wayne Hennessey, they’re all lined up for duty. Bring back the Home Internationals!